This letter was written by Pvt. 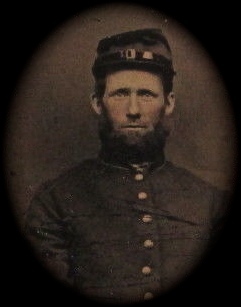 Joseph Dilatush (1834-1905) of Company K, 29th New Jersey Infantry. This regiment was mustered into the service on 20 September 1862 and saw duty in the Defences of Washington, D. C., till November, 1862. They were then moved to Aquia Creek, Va., and saw duty there guarding railroads till January, 1863. Moving to Belle Plain, Va., and joining the Army of the Potomac in January 1863, the regiment participated in Burnside’s “Mud March” January 20-24. The regiment was at Belle Plain till April 27 and then participated in the Chancellorsville Campaign, April 27-May 6 (Operations at Pollock’s Mill Creek April 29-May 2. Battle of Chancellorsville May 2-5.) They were mustered out 6 July 1863. The regiment lost 1 enlisted man killed and 39 enlisted men by disease. Joseph was the son of John Delatush (1814-1889) and Martha Mary Sutphen (1823-1853) of Monmouth, New Jersey. Joseph was later married to Mary M. Cottrell (1837-1904). 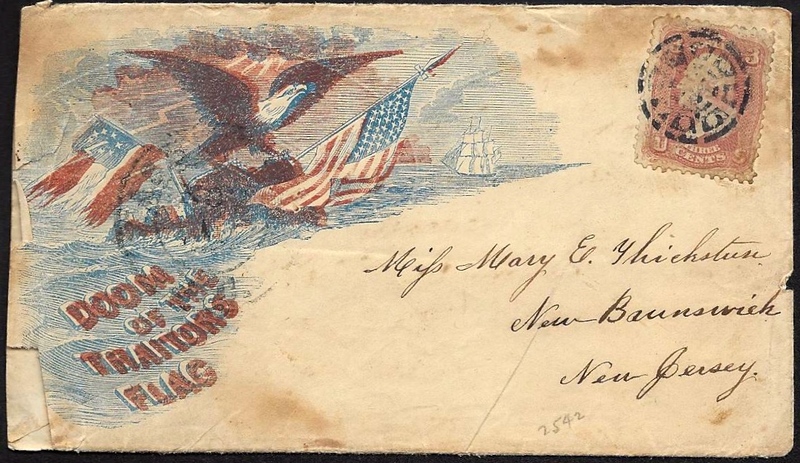 Joseph addressed this letter to Mary Elizabeth Thickstun (1843-18xx), a dressmaker in New Brunswick, New Jersey. She was the daughter of Edward Thickstun (1814-1893) and Ruth Ann Hansell (1816-1894). Census records indicate that Edward Thickstun was a blacksmith. On-line genealogical records reveal that, in December 1864, Mary married Joseph’s younger brother, James Thompson Delatush (1836-1906). I now take pleasure in informing you that I am well and enjoy myself as well as I expected to. We are now engaged in digging rifle pits and forts. We are encamped 8 miles from Washington and 2 miles from Chain Bridge upon a rising piece of ground. We have a nice view of some 8 or nine forts. Today we are mustered in to draw our pay. Thompson and Evert is well and send their love to you. We expect to stay here all winter but there is no certainty about it. I heard from home the other day. They was all well. The country here is rough and hilly. It is nearly all dug up — all that is worth having. There is thousands of acres of woodland cut down to prevent the rebels from crossing to the Capital. I am now in my tent and have but a poor chance to write or to think of anything to write to interest you. There is scarcely a house to be seen here and them are almost desolate. We seldom see a citizen. I suppose that you have almost given up the idea of securing a letter from me. I have intended to write before but I have neglected it. I must now bring my letter to a close by saying that all of us boys send their love to you and your folks. I do not know as I can think of anything more at present. Please write soon and tell me all the news. Give my love to all of your folks and reserve a share for yourself. Please excuse all imperfections. This entry was posted on Sunday, June 8th, 2014 at 2:00 pm	and posted in Uncategorized. You can follow any responses to this entry through the RSS 2.0 feed. Love this letter, what a great surprise to find this when I searched the name Dilatush ❤ Joseph Dilatush was my great great grandfather, just a delight to find this!!! Cyndy, I have been trying to contact you. Your e-mail on ancestry didn’t work. My great grand father Is William Dilatush. He was a farmer out on rt 33. His wife’s name was Elizabeth. I believe Joseph Dilatush is my great grandfathers father. That would make Joseph my great great grandfather. christine Baynton Tomlinson you can contact me at my email cyndymack@aol.com I have a tree on ancestry with pics where I went out to the farm of Henry Delatush in Black Horse/Burlington and marked his grave with the D.A.R. thank you Chris, going to forward it to my mother Jean Marie Delatush Mack due to she remembers more than I do regarding her family.